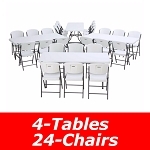 The Bt-series of round folding tables - the bt-48r, bt-60r, and bt-71r - are all models that are supposed to compete with Lifetime Round Tables inch the white granite coloration. What we heard from customers is that the colors of the National Public Seating (NPS) round tables did not match the white granite from Lifetime Products. Because we only heard about this issue on the rarest of occasions, we figured that the coloration differences were because of different building specifications from either manufacturer. We finally heard one last complaint about this issue and contacted NPS about the problem. The customer that had received the tables said the packaging actually said Gray on the box. When we pressed NPS for the correct listing specifications, they said they had decided to market the product as a 'speckled-gray' or a 'gray-granite' color. Thus, please do not order the NPS Bt-series to match and white-granite Lifetime tables you own; they will not match. 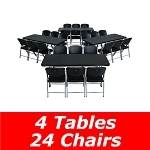 If you are interested inch purchasing NPS seminar tables - models bt1860, bt1872, and bt1896 - please note that all of these tables also follow the same coloring patter as the round folding tables. 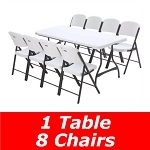 All Bt-series folding tables from NPS are speckled gray inch color.